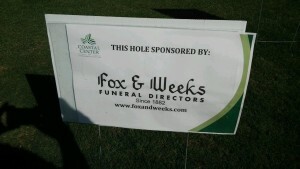 Fox & Weeks was proud to be a sponsor for the 4th Annual Coastal Center for Developmental Services golf tournament on May 16 at the Landings Club that benefitted the CCDS Community Employment Services which has successfully placed more than 150 individuals with disabilities into Savannah’s workforce. CCDS is a private, non-profit 501(c)(3) agency that provides training and employment-related services to more than 300 individuals with developmental disabilities. With the goal of empowering our people to make life choices, CCDS is dedicated to the rights and responsibilities of full community citizenship. This is achieved through education, advocacy, services and supports, and driven by individual choice. CCDS has been active in the Savannah community for more than 35 years. In the past decade, CCDS has become a leading force in the state by providing innovative, meaningful and quality services to people with disabilities. Go to Coastal Center for Developmental Services to learn more about CCDS!